New ownership of USA hot tub and swim spa manufacturer Catalina Spas is set to enhance shipping times and provide greater choice of model options for British and European dealers after a change in production location. 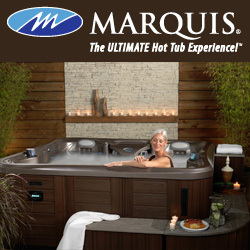 Catalina Spas hot tubs and swim spas, including the pictured best-selling Mardi Gras, have been manufactured for almost four decades in the same facility in California under the stewardship of the same family headed by Boyd Cargill. The brand has now been acquired by mid-range hot tub specialist LPI Inc, following Boyd’s decision to retire from the industry. The factory production will now be relocated to a new 318,000sq ft facility in Tennessee. Salisbury-based Catalina Spas Ltd Managing Director Stephen Crabb, who is preparing to celebrate the 20th anniversary of his family-run distribution outfit being associated with the brand, has welcomed news that the acquisition is going to boost the shipping process for his UK and European dealer network, as well help to introduce new products to maintain the tradition of being at the forefront of design and innovation. “Catalina Spas was the first to introduce many of the features that are now standard on a lot of today’s spas and swim spas,” said Stephen. 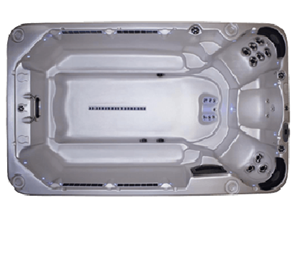 “Since 1978 Catalina USA established their reputation of hand-built high-end quality spas that were reliable, great design and value-for-money. In 1997 Catalina Spas Ltd was established to represent the brand both here in the UK and in other parts of Europe. “We are proud to be now entering our 20th year of continuous trading, our success and longevity is based on the same production principals and customer service. “Boyd, who is one of the USA’s well-known industry personalities, recently took the decision to retire and to sell the company that he has loved and cherished for over 39 years. We are now pleased to say the business interests have been acquired by LPI inc, a company that specialises in mid-range spas who were looking for a high-end spa and swim spa manufacturer to acquire. “This then is a perfect end and new beginning that opens a new and exciting chapter in the future developments of the Catalina brand and product range. Stephen, who also distributes Florida-based Dream Maker Spas that have the new six-seater Dream 600L in the choice of options, reported that among the many new Catalina Spas model introductions for the future will be an additional stable of entry-level acrylic options for dealers to increase their choice to prospective customers.